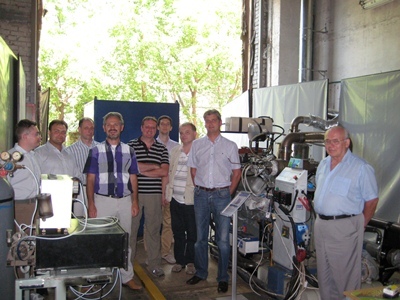 The fifth project progress meeting was held on 21-22 July 2011. The meeting was hosted by Russian project partner FSUE NAMI - Central Scientific Research Automobile and Automotive Engines Institute - based in Moscow, Russia. Meeting participants (from left to right): NAMI translator, Lev Lezhnev (NAMI), Alexander Kronberg (ECT), John Vos (BTG), David Chiaramonti (UFL), Andrea Maria Rizzo (UFL), Maxim Glushenkov (ECT), Bert van de Beld (BTG) and Valeriy Kirillov (BIC). Not on the picture: Boris Papkin (NAMI).